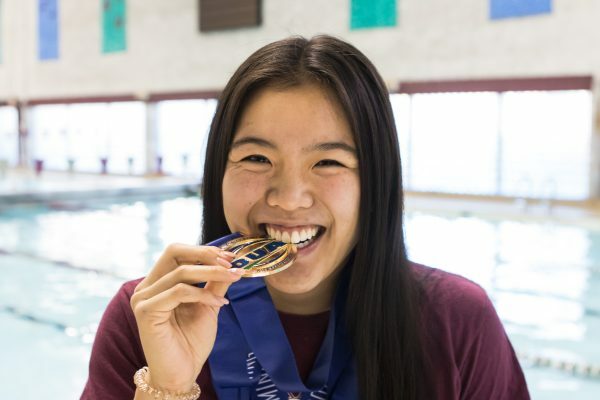 Coming into her rookie season on the McMaster swimming team, Isabelle Lei had few expectations as to what the year would hold. The British Columbia native was one of many in Mac’s large 2017 recruiting class, and has managed to make a name for herself across Ontario. The height of her success this year is something she did not see herself accomplishing just one year earlier. In her final year of high school, Lei found herself no longer passionate about the sport she has been taking seriously since she was 11-years-old. Honestly, I had zero expectations going into this year. The change of environment helped Lei find the fun in swimming again, seeing improvements in herself she had never seen before. That environment is something that the McMaster swimming team prides themselves on. Creating a family-like atmosphere where all swimmers feel supported is just as important as the races. When choosing schools in her high school senior year, McMaster’s Health Sciences program really appealed to Lei due to its style of discussion-based learning that she was familiar with from high school. Although it was an extremely competitive program and she did not have high hopes of getting in, she took a recruiting trip and experienced the swimming family first hand. So, when Lei received her admission to Mac, choosing was an easy decision. Yet her love for swimming still was not there. It was when she decided to push herself and try to come out of every practice, feeling like she is succeeding and having fun that she began to enjoy herself. In the pool, Lei has seen herself improve significantly. Although she has ended her rookie season with the medals to prove this, her success did not happen overnight. Not only did Lei begin to see it, but so did everyone else. 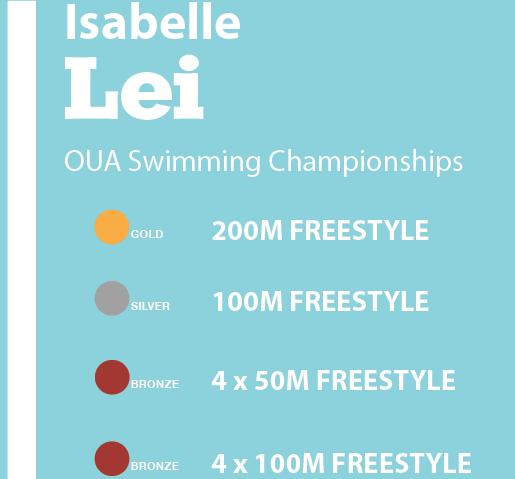 Prior to competing in the Ontario University Athletics Swimming Championships, Lei had earned a total of eight gold and two silver medals as a rookie individually and in relays. Lei then went on to medal in several events at the provincial championships. Lei won gold in the 200m freestyle, silver in the 100m freestyle and two bronze medals in the 4 x 50m freestyle and 4 x 100m freestyle. Despite all the hardware, the most surprising thing for Lei was taking home the OUA Rookie of the Year award. As a rookie, Lei would always hear the upper years talk about “OUA Magic” and finally experienced it for herself at that moment. Her magical performance during the OUA Championships guaranteed her a spot at the U Sports Swimming Championships two weeks later to compete in her six usual events and one new one — the 400m freestyle. “I hadn’t done it all season but because my 200m went so well at the OUA Championships, Coach Gray and I decided I should try it and I ended up recording my best time,” Lei explained. Although Lei did not place as highly at the U Sports Swimming Championships — a star-studded event featuring seven Canadian Olympic swimmers — the little victories still mattered. “[In the 200m freestyle], I went a little slower than I anticipated because everyone in my heat was going a little slow so I thought I was going faster but I wasn’t,” said Lei. “But in finals, I managed to go faster than I did and even though I didn’t record the best time, I was happy with myself because I set a goal to go under 2:04 and I was well under that goal. Setting goals and being able to check them off is something Lei has been doing all year. As she looks to the future, her swimming goals are bigger than just herself. If Lei is able to make the incoming rookie class fall in love with swimming the way she did in her rookie season, she would count that as one of her greatest accomplishments.